Every cancer patient has their diagnosis moment. It is a moment scorched on the heart and brain with a branding iron. Your head swims, your stomach drops through the floor and the world thumps, bangs and shouts at your senses. At this moment, the doctor will try to reach out to you, saying comforting things, stumbling to find the right words, and, if you’re lucky, suggest that there is a treatment available that will help you – maybe even save you. People say there have been great advances made in cancer treatments. Hope is, after all, as good an anaesthetic to the fear of cancer and pain of treatment as any pill. But the reality is that for many cancers – the majority in fact – there is no hope. Yes, there have been advances in some, including the various breast cancers. But for many, treatments are limited – often the only ‘option’ is the surgeon’s knife. Many cancers can’t be touched by pills or chemo. Most cancer deaths – around 53 per cent – are the result of so-called rare or less-common cancers for which, in most cases, there have been few advances in treatments. Take the ovarian cancers, from which my wife, Josephine Hart died. Typically it is diagnosed late. The treatment is brutal and mostly ineffective. One reason is that doctors cannot easily innovate – that is try new treatments – even when they know that the treatments they are using will fail. This is because the law forbids innovation. Any doctor who tries something new, who rejects the standard procedure, is liable to be dragged in front of the General Medical Council and struck off, or brought before a judge and sued. The doctor will lose his or her reputation and livelihood. As I write, the NHS faces a legal bill of £24 billion – half the UK defence budget – for medical negligence claims. Few doctors are prepared to swim against that tsunami. They need protection to try new treatments – for all our sakes. I have drafted a Bill – the ‘Medical Innovation’ Bill – that will let doctors innovate. They will only be able to do so under strict conditions. 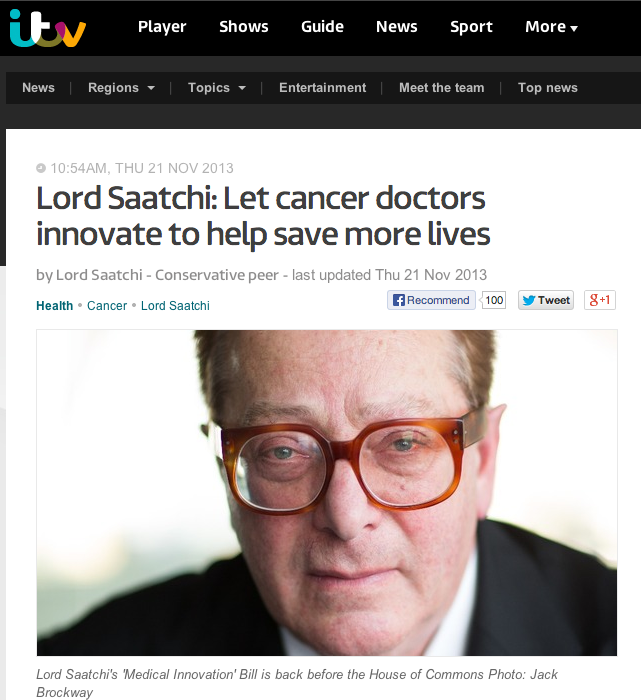 First, they must get agreement from a panel of experts who specialise in cancer treatment. And they need the agreement of the patient. If either the patient or the team doesn’t agree, then the patient can have the standard procedure. We don’t want patients being treated like mice. Many – most – medical advances, from the discovery of penicillin to the development of heart surgery, has been the result of an individual pushing the boundaries of medical knowledge, trying something new, swimming against the tide. Tomorrow, my Bill goes to the House of Commons. If it gets through, it has a good chance of becoming law. It won’t cure cancer. But it will help the man or women who will.